Give yourself a gift of Love. Ultimate beginner set of 3 yoni eggs. Start from the large egg and work your way up to the smallest egg as you progress. All yoni eggs you will ever need. 3 different gemstones that are traditionally used in Taoist practices that come in 3 different sizes. All the eggs in the sets are sideways drilled. This Yoni Egg comes in elegant signature black gift box. Carrying pouch and practice guide included. Ultimate beginner set of 3 yoni eggs. Start from the large egg and work your way up to the smallest egg as you progress. All yoni eggs you will ever need. 3 different gemstones that are traditionally used in Taoist practices that come in 3 different sizes. Set of 3 A-Grade All Natural Rose Quartz Gemstone Drilled Yoni Eggs. Set of 3 All Natural Black Obsidian (Volcanic Glass) Drilled Yoni Eggs. This set comes in elegant signature black gift box. Carrying pouch and Yoni Egg practice guide included. Please note that each stone is unique in appearance just like every one of us. Because all of our yoni eggs are cut from 100% natural stone, there is always color variation. Actual yoni egg you received might not look exactly the same as the one showed in the pictures above. 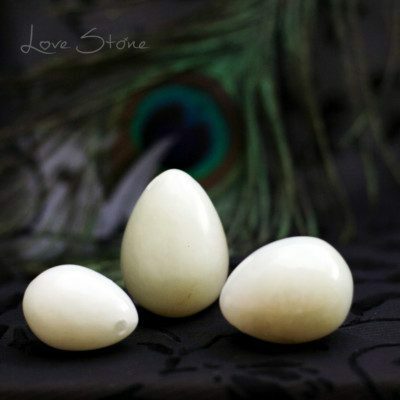 Color of the jade egg: lighter green, dark green, or black. All our stones are quality inspected before they’re sent out.